Prague: Why Not Intervene to Claim Kafka's Papers. Fetch! It Is Getting Late! "Woman must relinquish Kafka papers, judge says." NYT at A9. October 15, 2012. Summary: Israel's national library shall receive the documents written by Franz Kafka and friend Max Brod. Mr. Brod's former secretary had possession, had sold some. Mr. Brod had bequeathed them to her. Her daughter, in turn after the mother's death, sought to retain. Issue: were the documents bequeathed in trust, or as gift. Trust, so far. Ms. Hoffe may appea. "with the library of the Hebrew University of Jerusalem, the municipal library in Tel Aviv, or another public archive in Israel or abroad (emphasis added)." Kafka is a Son of Prague. Prague. Is anybody home? Prague? Prague? Do it! Intervene! Prague - intervene to get the papers back. You have lawyers. The man is buried in your Jewish Quarter. There is a heritage to reclaim. Go! The unforgettable visuals -- in the Jewish Quarter -- the wall bug, and the empty suit - see Prague, Franz Kafka, Empty Suit, Giant Bug. The point here is not only to educate people about Prague's Franz Kafka. It is to show that this life, manic in a way, interesting, sad, neurotic, magnetic, exciting, tragic, odd and should be part of Prague's heritage -- not in Jerusalem or Tel Aviv or Germany, for heaven's sake. Franz Kafka: prodigious novelist, diarist, sketch writer, manuscript producer, and a vaguely-practicing Jew, was born in 1883 in Wossack, south of Prague, to a dry-goods merchant father and more well-to-do mother. He was well-educated in German schools, German being the cultured area language of the day. He wrote and wrote, destroyed most of his own work, died of TB in 1924. Some works remain, the subject of the Israeli litigation. 2. Litigation story about the remnants of Kafka's work. Find a fine review of events in the September 20, 2010, in the New York Times Magazine article: Kafka's Last Trial. Basic issue: Who is executor of what, as to which will, and who is beneficiary of what? Rights flow from that determination. The sisters now claiming the papers as their private property. Are they beneficiaries or mere executors of a far earlier will, in which case the papers revert. Although Kafka incinerated some 90% of his own writing, some 2/3 of what remained ended up in the Bodleian Library at Cambridge *; the last 1/3 of that 10% remnant of a total unknown (herein The Batch) stayed in his friend's possession, Max Brod. Max moved to Israel with it, and died in 1968. The Batch then ostensibly passed to his secretary and amour-likely, Esther Hoffe. In 1988, she auctioned The Trial for two million. It ended up in Germany. Kafka's three sisters died in the death camps. Not a nice place for his papers. He is not even German himself. Esther Hoffe died in 2007 in Israel, leaving The Batch to her daughters, Eva Hoffe and Ruth Weisler who escaped Prague in the Nazi era. They want the papers sold at their profit to Germany (Germany!) -- the German Archive in Marbach. What? Kafka's sisters were killed in the Shoah. His religious-orientation group, etc.... The papers they do not sell to Germany, they want kept in their Swiss (Zurich) and Israeli (Tel Aviv) bank vaults; and/or in Eva's apartment on Spinoza Street in Tel Aviv with her multiple multiple pi square root to the nth degree cats. Perhaps some 40-100 of the darlings. Kafka as anyone's private property?? See details at the NYT Mag. Apparently, Brod himself was thinking of depositing The Batch at the Hebrew University at Jerusalem. But he never followed up. Esther Hoffe herself had planned to deposit The Batch at Marbach, but she also never followed up. So now we have The Daughters. Or just Eva Hoffe. Is Ruth out of it? She married and moved away, and it is Eva who has lived with her papers and cats for 40 years. Ruth is probably still in. Will of Max Brod: Stay tuned. Tel Aviv is not interested, but that leaves not just the Hebrew University -- but another public archive abroad and not necessarily in Israel as A Contender. Papers to Prague, says this corner of the world. Prague has a claim to the Kafka papers. 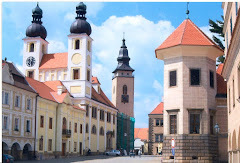 FN 1 Prague: Franz Kafka moved to Prague at 18, began clerical jobs and sporadic writing. At University, studying law (after other areas did not interest him) he formed a close friendship with Max Brod - who figures mightily in the later tale of Kafka's papers. Kafka had a regular career life, nothing spectacular. He went into business pursuits, and a family business for a while. Brod encouraged him to publish some works, which Kafka did in 1918 or so. His frequent and varied escapades with the ladies are a puzzle for another time. Poor lasses: had to be either nice or not, and twain could not meet. A lifetime doing the nasty, as one biography site puts it? Not him, see ://www.kafka-franz.com/kafka-Biography.htm/. Attraction, repulsion for what he was doing, neurotic perhaps, adequacy, inadequacy, all that. Poor Kafka. Lucky ladies for not marrying that one. Then along came Felice, to whom he wrote letters (sold for a pittance in the 1950's), Gerti and Grete, all nice girls. Meanwhile, Kafka went into a health sanitorium. Did Grete have his child? Or is that tabloid fodder? Grete was later beaten to death by the Nazis in 1944, so the answer is gone. Kafka was exempt from soldier service in WWI because of his job at an insurance institute partially owned by the government. He was diagnosed: tuberculosis. Felice left the field and married someone else, Bauer. Kafka probably said, "Whew. Dodged that bullet." Then along came Julie and Milena Jesenska: Milena's daughter wrote a book about her mother and her mother's relationship with Kafka. Then Dora Diamant who apparently never recovered from her awestruck and possessive love of Kafka. His health deteriorated, and he died in 1924. He is buried in the Jewish Cemetery in Prague. While he lived, Kafka himself burned some 90% of his works, see NYT Magazine 9/20/2010.